Box Text: Ecco is older, strong and engulfed by dangers! The evil Vortex has shattered the mystical Asterite, Ecco and Trellia, a beautiful dolphin of the future, cross 100 million years of time to save the dolphins and all life on Earth! - Ecco morphs! Charge a metasphere to become a shark with all its fighting power! Change into a seagull and fly! Safely swim past dangers as a jellyfish! - Over 40 levels of spectacular aquatic adventure, with password save. - Five levels of challenging 3-D travel through the vast waters of the open ocean! 08-02-2015 Seikenfreak Box Text Ecco is older, strong and engulfed by dangers! The evil Vortex has shattered the mystical Asterite, Ecco and Trellia, a beautiful dolphin of the future, cross 100 million years of time to save the dolphins and all life on Earth! - Ecco morphs! Charge a metasphere to become a shark with all its fighting power! Change into a seagull and fly! Safely swim past dangers as a jellyfish! - Over 40 levels of spectacular aquatic adventure, with password save. - Five levels of challenging 3-D travel through the vast waters of the open ocean! 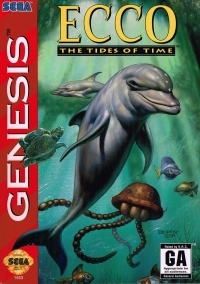 This is a list of VGCollect users who have Ecco: The Tides of Time in their Collection. 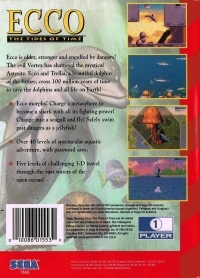 This is a list of VGCollect users who have Ecco: The Tides of Time in their Sell List. This is a list of VGCollect users who have Ecco: The Tides of Time in their Wish List.